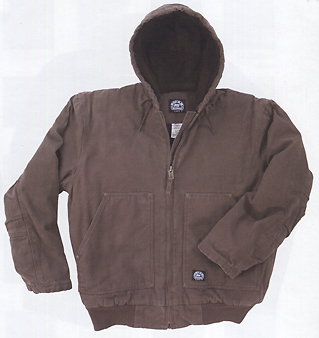 Work jackets that keep you warm. Insulated and fleece lined. This gives a comfortable hand, and another layer of air trapping warmth. All this without feeling thick & round like a snowman. Features that let you move with ease while you work. Reinforced everything, and a lining that makes this hooded work jacket a great choice for the coldest days of the year. Wear it more open, to keep the chill off your back, or close it up for those colder days. 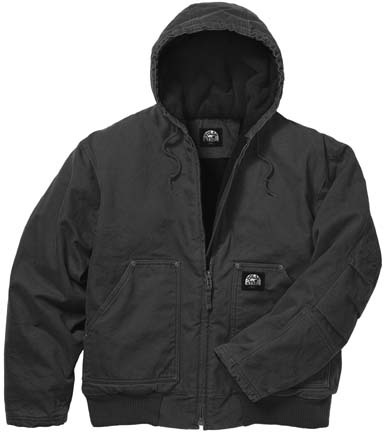 Polar King Premium Insulated Hooded Fleece Lined Duck Jacket. Size: Regular - SM, MED, LG, XL, XXL, 3XL, 4XL, 5XL. 100% cotton heavyweight duck. Heavyweight bonded polyester fiberfill insulation. Fleece body lining. Black taffeta sleeve lining. Recessed dyed-to-match knit storm cuffs with self-fabric facing. Antique brass hardware. #8 front zipper with extended self-fabric pull. Rivets at stress points. True bi-swing action back with hidden elastic. True articulated elbow. 4 piece sleeve. Two lower front pockets with fleece lining. Two interior storage pockets with Velcro closure. Three piece fleece lined hood. Triple needle stitching. Locker loop. Ordering Made Easy. Shipping Questions? Click Here.